We increase our activity levels when embarking on a diet regime, so why is it we don't always get the weight loss boost we're expecting?. Research suggests that some of us increase our food intake by merely thinking about the exercise we're going to do later. For others, exercising provides a legitimate excuse to eat more. So is exercise - even just the mere thought of it - actually a hindrance to our weight loss? Ever said to yourself "I'm going to the gym later so a couple of biscuits now won't hurt"? Research has shown that even just thinking about exercise can cause us to eat up to 50% more. This is believed to be due to a subconscious reward theory whereby we reward ourselves with food for the forthcoming physical effort. But the problem is, if you don't end up going to the gym, those extra biscuit calories are heading down to your hips, surplus to requirements. Then there's the reward when we HAVE actually managed to do the exercise. How many of us rationalise our treat by saying 'I deserve that slice of cake, I went for a run earlier'. It's human nature to feel we should reward ourselves for achieving something challenging, but the reward for exercising is generally some kind of food treat. And if we're not careful, our treat may actually contain more calories than we've actually burned off during the exercise session! "I'm exercising loads more than I used to but haven't lost anything!" If your exercise programme is not having the effect on your weight loss that you'd expected, you need to take a very close look at what you're eating. Whether it's subconscious pre-exercise snacking, or a post-exercise reward, it's all too easy to cancel out the entire calorie burning benefit of all the exercise you've done. So record everything in your Nutracheck food and exercise diary so you can see how the balance stacks up. That's not to say exercise isn't worth doing - it has so many positive health benefits, such as building cardio fitness, muscle tone and posture, regular activity should be part of your new lifestyle. But if your exercise motivation is to actually boost your weight loss, then getting the food part right is vital. Failing to monitor your exercise-related eating can mean your weight loss grinds to a halt, or at worst you gain weight! While some of this gain may indeed be muscle (it's true that muscle weighs more than fat), this isn't really the result you'd hope for when incorporating it as part of your weight loss regime. How we feel about exercising is personal. Some may use it as an excuse to eat more, others enjoy it purely for its energising, health enhancing benefits. If you are of the view that breaking a sweat in the gym is a necessary evil when dieting, we need to try hard to change of negative perspective of exercise and break the habit of always rewarding ourselves with extra food. Although habits can be hard to break, it's not impossible. And you may even start to enjoy your exercise routine the fitter you become! Next time you do some exercise, reward yourself with something other than food. Treat yourself to a nice long bath or why not say "If I go to the gym 3 times this week I can buy myself that new top I've been wanting for ages". Preparation is key! If you find you need a little extra energy while you exercise, or you get particularly hungry after exercise, plan your meals and snacks accordingly. Still stick to your calorie allowance but just make sure you have some spare for a snack when you need it most. A combined carbohydrate and protein snack such within 15 minutes of finishing exercising is great for muscle repair and will also help restore your energy levels. 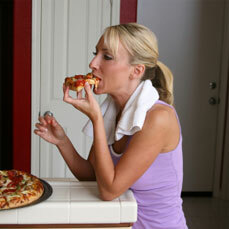 The toughest of them all - ultimately this association between food and exercise must be broken. It will require conscious effort, but try to stop viewing exercise as punishment that requires a reward or simply an excuse to eat more. Try to view exercise as the health boosting, energy boosting, life lengthening activity that it is! The 21 day rule. It takes 21 days to form a new habit - or break and old one. Expect it to take this long before your new eating healthy plan and view of exercise starts to feel routine. It is possible to change your mind set. You learned to feel the way you do now, and you can make a positive mind connection between exercising and many other positive, enjoyable and non-food benefits! Finally to point out we're talking about moderate increase in activity here (200 - 300 calories extra a day). If you are exercising heavily, then of course it is perfectly acceptable and in fact necessary to replace calories burned, and you should be listening to your body. But in the context of using exercise to ensure weight loss, a calorie deficit is required. Moderate exercise is crucial in helping to achieve this deficit, as reducing food intake alone may not be sufficient.